Footage has emerged of an endangered Grey Nurse shark being freed from an elastic cord noose off a beach in Sydney, Australia. Experts had to manhandle the shark to the surface to perform the tricky operation. 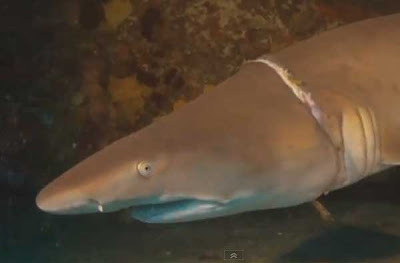 Local had divers spotted the young female grey nurse shark tangled in an elastic cord which was cutting into its gills. Her laboured breathing was a sign of distress triggering the daring rescue at Magic Point, which is a crucial shark habitat. The challenge for a team of divers and a vet from the SeaLife sanctuary and aquarium was to save the shark. The team had to get the shark to the surface and coax it into a plastic shark sock, clear so the shark would not see it as an obstacle. The shark was then wrapped in a special stretcher and that's where the professionals had to get a little hands-on. A quick underwater wrestle did the job and the injured shark was taken up to waiting vet Rob Jones; the water's surface was his operating table and there wasn't much time.